Alitalia is finally set to become the eighth airline in Etihad Airways' Equity Alliance, as the two airlines on 08-Aug-2014 announced a transaction implementation agreement under which Etihad will invest EUR560 million in Alitalia for a 49% stake. That investment, together with injections from other investors and additional financing and loans will create a EUR1.8 billion investment deal for troubled Alitalia. "The future is secure," Etihad CEO James Hogan said in Rome. Its competitors must now prepare for a more competitive Italian market. Although Mr Hogan warned "there's no quick fix", his quick three-year re-structuring plan projects Alitalia to post a EUR100 million profit by the end of 2017. Alitalia will re-brand as early as 1Q2015 and will exit loss-making short-haul markets and introduce long-haul growth from multiple Italian cities to Abu Dhabi as well as global destinations. China can be expected to be a focus, with some services routed via Abu Dhabi. Mr Hogan affirmed the value of SkyTeam to Alitalia and expects the alliance membership to continue. Etihad's Alitalia investment has hallmarks of past deals, with Etihad buying into Alitalia's frequent flyer programme and conducting a sale-and-leaseback agreement for its London Heathrow slots. Both Alitalia and Etihad avoided being drawn on details of sticky matters like redundancies, mounting European opposition, "effective control" and if Alitalia really can be saved. Some matters will become clear in the short term and others will take longer, but Mr Hogan is unambiguous: "Our entry into Alitalia has no exit strategy." Alitalia CEO Gabriele Del Torchio observed that just under a year ago – on 14-Aug-2013 – he visited Abu Dhabi for the first time and that during the long and often public negotiation phase, “there were turbulent moments”. Mr Del Torchio reflected on Alitalia's being re-born on a few occasions but his job was to finally give Alitalia a solid future, and that Alitalia saw that could only be done with an international partner. Mr Hogan thanked Mr Del Torchio for his work, but in all likelihood Mr Del Torchio has secured Alitalia a future in which he will no longer be part as Etihad typically brings in its own management staff, as it did in other equity alliance members Air Serbia, Air Seychelles, Etihad Regional and Jet Airways. Etihad's proposed stake was approved by all of Alitalia's unions and categories of association (pilots and cabin crew), with job losses expected to be capped at 2,000. Etihad and Alitalia will brief staff in the first week of Sep-2014 regarding details of the restructure. “The time for change is now," Mr Hogan said. It is possible staff impacted could be offered a job in Abu Dhabi with Etihad. 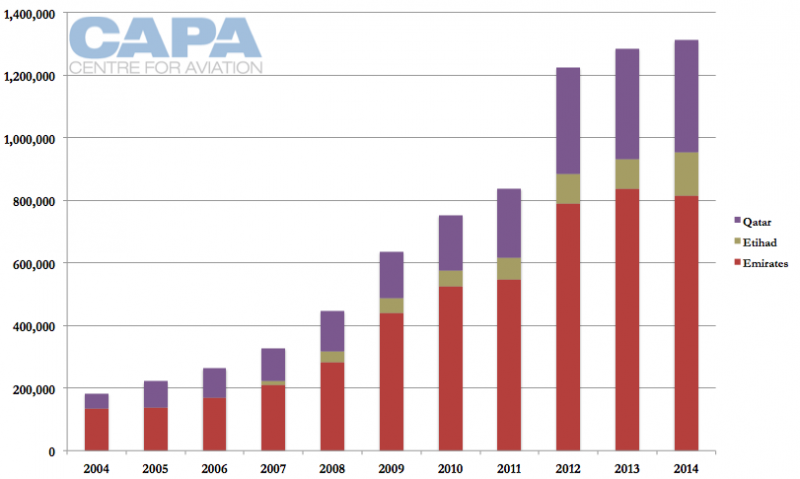 Nonetheless, further opposition from European airlines is all but guaranteed. Etihad in Jul-2014 was unusually public and direct in calling out the state aid the Lufthansa Group has received in the past. 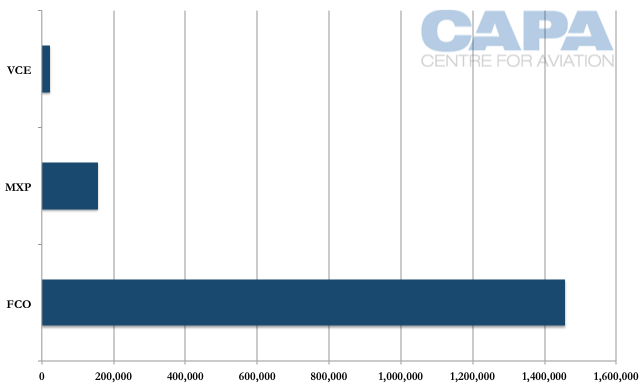 Etihad is acquiring a carrier not significantly smaller than itself. Alitalia has about 45% more seats, but a higher short-haul exposure; Etihad has twice the ASKs of Alitalia. Alitalia is the largest carrier Etihad has invested in since airberlin, but arguably Alitalia is more significant given the larger proposed stake (49% versus 29% in airberlin). It also has a stronger relative position in its valuable home market. Alitalia will be Etihad's fifth equity member in Europe, a key area for Etihad's partnership strategy. 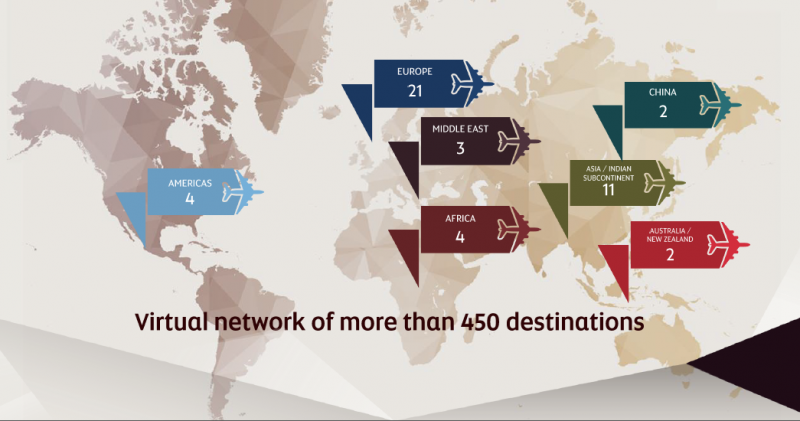 Almost half – 21 – of Etihad's codeshare partners are in Europe. Etihad plans to reduce Alitalia's narrowbody fleet by 13% while growing widebody aircraft by 32% by the end of 2017. Alitalia's in-service widebody fleet comprises 22 aircraft (A330s and 777s). 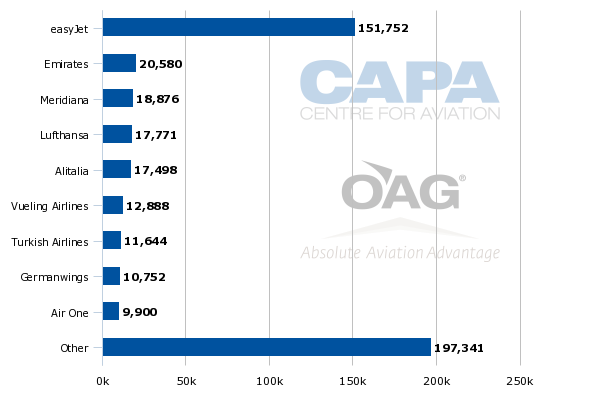 A 32% increase would see approximately seven widebody aircraft join the fleet for a total of 29 widebody aircraft. Etihad has flagged aircraft could come from its existing order book. This would make Alitalia the largest widebody aircraft operator in the Etihad equity alliance. 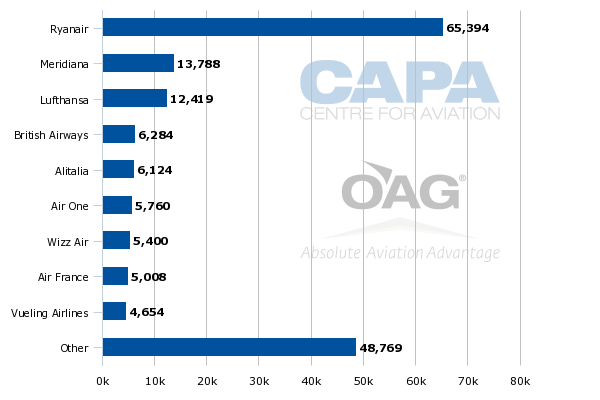 Of major widebody operators in the alliance, airberlin has 14 widebodies while Jet Airways and Virgin Australia each have 12 and Aer Lingus (a smaller equity member) has only six. Alitalia's potential 29 widebodies compares to Etihad's 63 widebodies as of Aug-2014. Alitalia's 90 in-service narrowbody aircraft, all in the A320 family, stand to be reduced to about 78 aircraft. 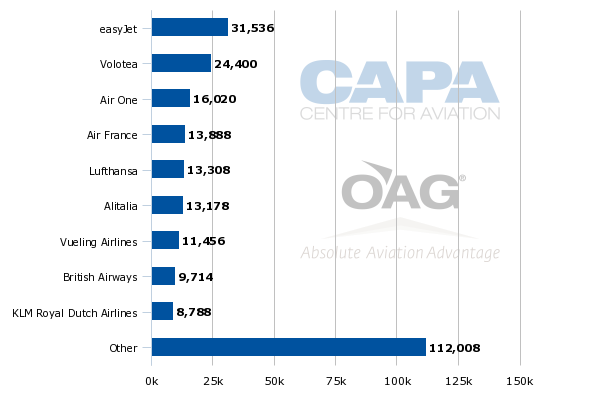 Alitalia's A320s are on average 10.1 years old, according to the CAPA Fleet Database. Firm orders include those placed directly by the operator and by lessors assigned to the operator, from 4-Aug-2014 onwards. As Alitalia has struggled over the past decade, stumbling from near-bankruptcy to on-the-brink salvation on more than one occasion, its valuable domestic market share has rapidly eroded. Low-cost airlines have inevitably intruded, but for several markets the de facto long-haul hubs have shifted offshore into Germany, as Lufthansa in particular has aggressively targeted north Italian traffic. In the absence of an Alitalia capability, the valuable Milan market for example was only modestly served non-stop by three American airlines to New York, leaving the opportunity for Emirates in Sep-2013 to mount a successful fifth freedom operation (possible under the respective open skies agreements, but predictably being challenged by Delta in the Italian courts). Much of the US market is otherwise serviced by sixth freedom operations like those of Lufthansa's. Although Etihad will want Alitalia to scale back parts of its unprofitable short-haul network, Etihad wants to see Alitalia recapture traffic in northern Italy, at Milan as well as airports such as Bologna and Venice. In the week commencing 04-Aug-2014, Lufthansa is larger than Alitalia at each of the three airports (in Bologna, Lufthansa has twice the presence of Alitalia). "A key part of what we're going to be doing is ensuring in the north of Italy – which is dominated by another German carrier – that we have the ability with airberlin to stretch the network," Mr Hogan said. "So instead of people flying to maybe German or Switzerland airports, they fly into Italian airports to fly within Europe and long-haul." The fleet changes indicate Etihad's direction for Alitalia: scaling back in short-haul markets, where Alitalia has been unable to compete with high-speed rail and ever-growing incursions by low-cost carriers. Alitalia will embark on growth in long-haul markets, where it has had a limited presence in recent years – despite being the sixth most visited country in the world (over 46m visitors a year) and fourth largest in Europe by volume. Etihad plans to boost long-haul traffic from Milan and especially Rome, which is already Alitalia's largest intercontinental hub. Etihad has plans for Rome to become a larger European intercontinental hub. Etihad says up to five new routes could be added over the next four years, while long-haul flights from Milan Malpensa could more than double to 25 flights a week by 2018. 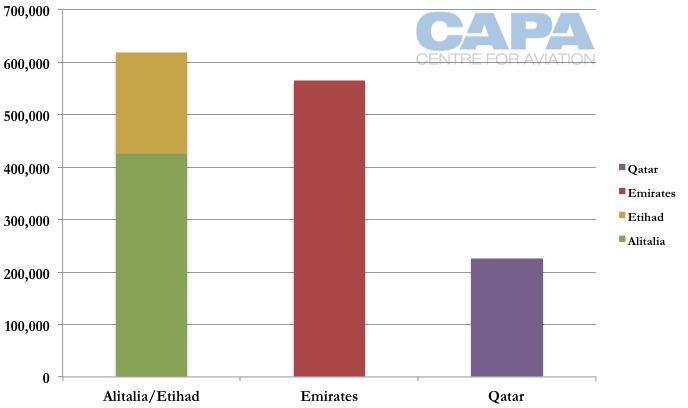 Alitalia has an especially light footprint in Asia, as discussed in a previous CAPA analysis that also speculated that Alitalia's Americas network could be of interest to Etihad, in addition to building Abu Dhabi services. In some instances Alitalia can avail of traffic rights Etihad cannot, enhancing the mutual opportunities. 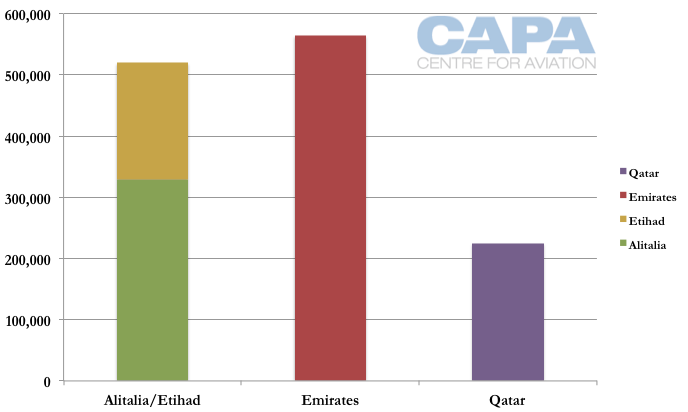 Etihad entered Italy after Emirates and Qatar Airways and has a considerably smaller footprint than the other two. Etihad has flagged growth in the Italy-Abu Dhabi market, with Alitalia to open service to Abu Dhabi from Italian cities such as Bologna, Catania and Venice. In Aug-2014 Catania has no passenger service to destinations outside Europe, while Bologna sees service to three African points. Venice has a more global footprint with links to Africa, Asia-Pacific (albeit one destination: Tokyo Narita) and the Middle East (Tel Aviv, Emirates to Dubai and Qatar Airways to Doha). Alitalia has already increased its Rome Fiumicino-Abu Dhabi service from four to five weekly and from northern winter 2014/2015 will bring the service to daily while opening a Milan Malpensa-Abu Dhabi daily service, complementing Etihad's daily services to Milan and Rome. Once this is done, Etihad and Alitalia will combined have more Italy-Gulf capacity than Qatar Airways and will for the first time come within range of Emirates' capacity. If we assume Alitalia launches daily Venice-Abu Dhabi flights and then three weekly flights to Abu Dhabi from two other Italian cities, Etihad and Alitalia combined will have more than double Qatar's 2015 projected seat capacity and just under Emirates' seat capacity. Were Alitalia to bring the two other Italian destinations to a daily service to Abu Dhabi (or launch other Abu Dhabi services), Etihad and Alitalia will combined have more capacity than Emirates or Qatar. 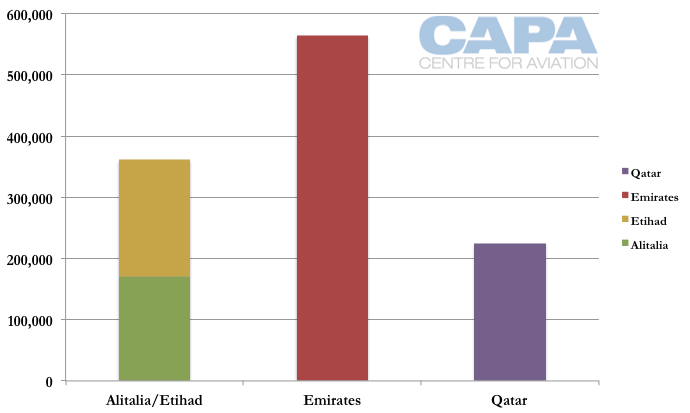 However, this is based on Emirates' and Qatar's planned 2015 capacity and in reality they are likely to try to increase capacity to counter Etihad-Alitalia. This is a similar strategy as applied to other Etihad equity partners flying to Abu Dhabi to feed Etihad's hub. This is most notable with airberlin, which serves Abu Dhabi from Berlin, Dusseldorf and Stuttgart. 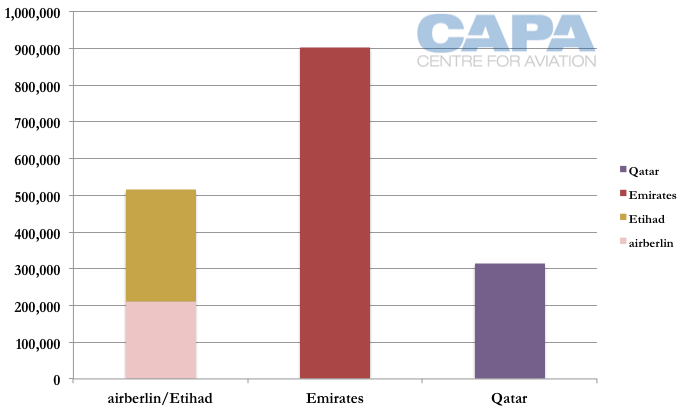 airberlin and Etihad combined have more Germany-Gulf seat capacity than Qatar although Emirates once again leads the pack. Alitalia could have an expanded Americas presence as an Italian hub there is in closer range and does not need ultra-long-haul aircraft, unlike Abu Dhabi. Asia is also a natural growth market for Alitalia, and flights could potentially be routed through Abu Dhabi to allow Etihad to place passengers across its network on the services. In some of Etihad's equity partnerships, there are requirements for airlines to have a flight transit Abu Dhabi if flying past the hub, such as airberlin needing to transit in Abu Dhabi for Asia-bound flights or Jet Airways transiting in Abu Dhabi for US-bound services. Mr Hogan said Etihad was ready to re-brand Alitalia as early as the first quarter of 2015. “Alitalia is going nowhere, but the way Alitalia is going to look in the future is certainly going to be different,” Mr Hogan said, indicating that Alitalia, the name, will remain – instead, perhaps, of an extension of the "Etihad Regional" brand introduced with the proposed acquisition of Darwin Airline. Mr Hogan said the Alitalia brand should convey Italy's reputation for food, fashion, luxury, culture, history, creativity and innovation. “The sexiest airline in Europe should be Alitalia”, Mr Hogan said, apparently willing to pick favourites of his European investment airlines. The re-branding will include changing Alitalia's product and service. A product change does potentially entail a significant investment, but German reports indicated that when airberlin updated its product, Etihad paid for the seats and leased them to airberlin, lightening airberlin's short-term commitments. But the value of a standard product flows through the Etihad alliance, implying that the main beneficiary would be Etihad itself. As a result of Etihad's stake, Alitalia can be expected to codeshare and form commercial ties with Etihad's other equity partners. For example, airberlin and Virgin Australia codeshare (despite airberlin being a member of oneworld, the alliance of Virgin competitor Qantas), as do Air Serbia and Etihad Regional. In some instances Alitalia already has commercial arrangements with Etihad's other equity partners, such as Air Serbia. Such partnerships extend Etihad's equity model from one that revolves around Etihad to one where Etihad is the nucleus and catalyst for other satellite deals that help its partner airlines. In some instances partnerships amongst equity members form without Etihad, while in other instances Etihad helps make them possible. Mr Hogan made clear Alitalia's membership in the SkyTeam Alliance would remain, although it is unclear how members – such as anti-Gulf carrier Delta – will feel about Alitalia's new ownership. “SkyTeam remains a key pillar of the Alitalia strategy,” Mr Hogan said. There are also growing ties between Etihad and individual SkyTeam members, including Air France itself and KLM and Kenya Airways. 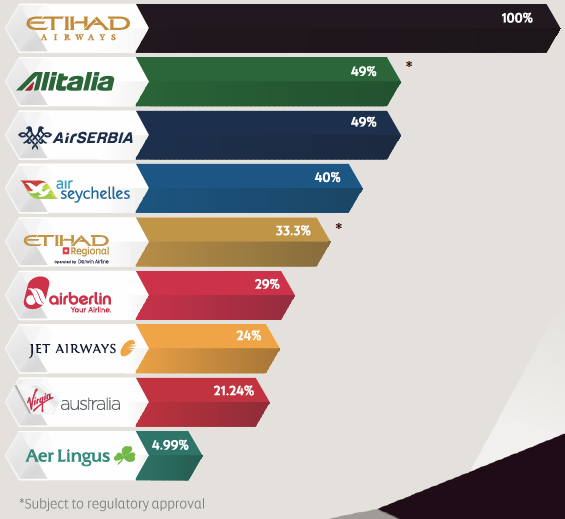 Etihad's 75% acquisition of Alitalia Loyalty Spa, which operates frequent flyer programme MilleMiglia, brings Etihad 4.3m members – the largest yet – into its fold. This represents a 47% increase in members. Etihad took a stake in topbonus, airberlin's programme, after the initial investment while Etihad's stake in Jet Airways' Jet Privilege occurred with the major transaction. Mr Hogan continues to see opportunity in the frequent flyer division and to make it more sophisticated and holistic, evolving it into a "lifestyle" programme. As part of the arrangement, Etihad will pay EUR60 million for Alitalia's five London Heathrow slot pairs and then lease the slots back to Alitalia. “We’re not going to use them,” Mr Hogan made clear. Deals such as the slots and frequent flyer programme allow Etihad to invest supportively but indirectly in a business without increasing equity. Ideally, this involves a win-win for each side. Alitalia has lost over EUR1.1 billion since its 2009 reincarnation. In that light Etihad's projection of a EUR100 million operating profit by the end of 2017 seems optimistic and will require a clear focus on both cost and revenue sides if it is to be achieved. This fact clearly explains why Etihad is looking to reduce Alitalia's short-haul flying. As a standalone operation, that should have been Alitalia's objective too; but it was hardly an option with a limited long-haul fleet and diminishing domestic feed. With no room to move, the Italian flag carrier's days were numbered. Others have been to the well before, believing that they could add to Alitalia the ingredients that would deliver synergies beyond the 1+1=2 equation; KLM effectively merged with Alitalia in the 1990s, then Air France invested before becoming frustrated with the lack of cooperation, and inability to generate the necessary upside. Much of Air France's interest – in what is one of the more valuable European markets – was in leveraging the opportunity to feed its home hub. Lufthansa chose to achieve a similar goal through direct market moves. Meanwhile, making the essential moves to reduce costs – staff count and productivity – continued to be elusive, as the presumption lingered that Alitalia somehow had a right to exist where others had to suffer pain to restructure. But timing is everything. Although today there is still a lot of fat in the Alitalia operation and attitudes still have a way to go, it is a very different organisation from the airline of five years ago. It is leaner and Mr Del Torchio has instilled the beginnings of a new belief in a future. Many of the realities of the market have been exposed and better understood as others around them went through contortions to survive. In the most basic financial analysis, even if Alitalia achieves the 2017 profit target, Etihad will only generate a EUR49 million return on investment (its 49% share of a EUR100 million operating profit). That EUR49 million is only after investing EUR560 million over three years (and potentially more, if airberlin is any indication) – hardly a sound short term financial investment. But that was never going to be the primary goal. Etihad is not working from a position of a hub carrier under threat from a changing marketplace, as the two main European airlines are. It is in expansion mode and has the ability to take a longer term view. Etihad is building the foundation of a unique alliance which, if it delivers its promise, could deliver unprecedented synergies. It is part of a long term strategy in which the value of a larger network, route access, passengers flowing onto Etihad and other equity members, global scale – are the prime reasons. But evaluating the outcome is difficult; it is of necessity a long term strategy, where the advantages accrue progressively. That much is still to be proven. There is no road map for this strategy, but there are early signs that it is working. In its most recent financial report, for 1H2014, Etihad reported that partner revenue accounted for 23% of total passenger revenue, worth USD471 million. It is on track to generate USD1 billion from partner revenue for the full year. While it is the equity investments that attract the bulk of attention in Etihad's strategy, the 47 codeshares it now operates as part of its non-organic growth strategy include many that are not equity partners. In 1H2014 JetBlue was added as a codeshare partner and will help Etihad at the LCC's hub in New York JFK, where Etihad will have double daily services (in combination with Jet Airways). In Jul-2014 Etihad also announced a partnership with Gol, designed to support Etihad's Sao Paulo service. Initially these deliver relatively small impacts but have the potential to grow significantly in the long term. The consistent theme, as with the equity partnerships, is to enhance traffic feed beyond the third-fourth freedom gateways to which Etihad operates. Adding Alitalia to the mix is a major step and one which adds great weight to Etihad's bid to access and connect European markets. As a result it is sure to increase the intensity of opposition to the Alliance. Coincidentally, the period for European Commission examination of the partnership application will run in parallel with the EC's examination of the wider issue of ownership and control. Thus the next few months could prove definitive at a time when the tide of liberalisation in Europe appears to be turning back towards restrictionism. It is hard to contemplate the prospect of winding back the equity acquisitions already made; and rejecting the Alitalia agreement would be tantamount to signing the airline's death warrant. Yet establishing a generic definition of "effective control" risks introducing a regulatory burden for the future that could ensure a much more actively interventionist – and inevitably political – regulatory role for the Commission. That is hardly consistent with the vision laid out by the framers of Europe's modern airline system. It was much more about ensuring an open and consumer friendly marketplace – not about protecting the status quo.